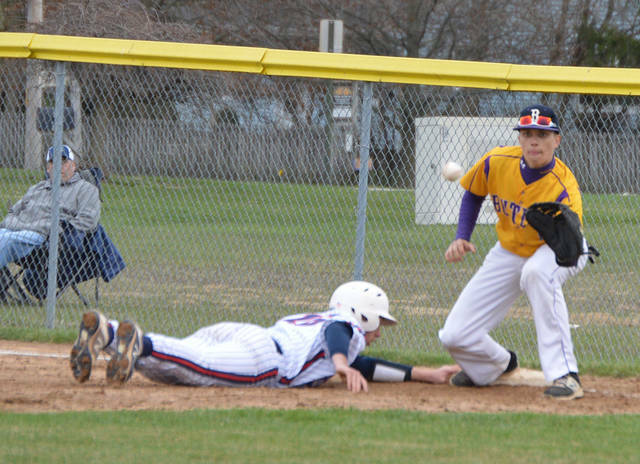 Preston Tofstad takes a throw from Ryan Qvick to hold a runner at first base. 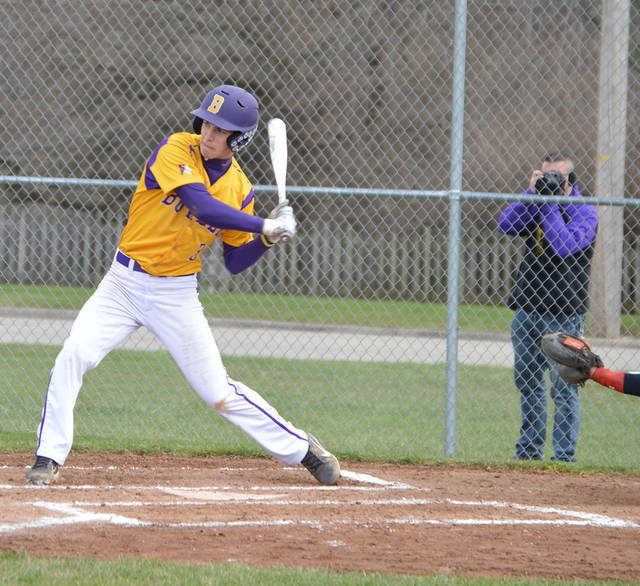 Dolen Fults waits on a pitch that set up a sacrifice fly for Butler’s first run of Thursday’s game versus Piqua. Ryan Qvick struck out nine and surrendered just three hits in five innings to pick up the win over Piqua. 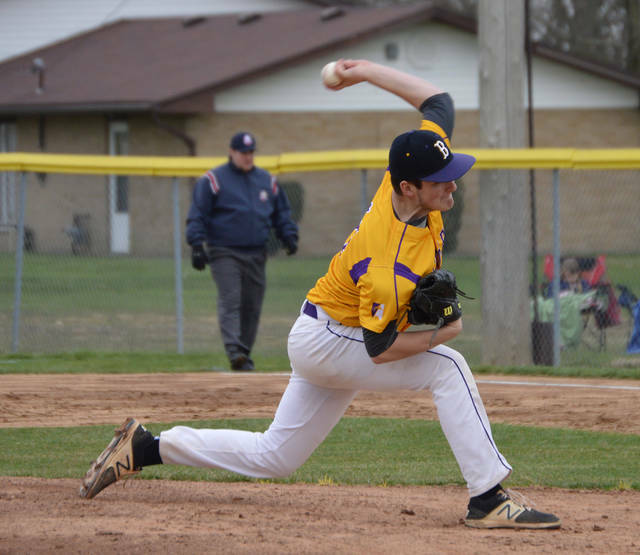 VANDALIA — The Aviators (4-3, 2-0) picked up their second straight win Thursday evening, powering past Piqua 9-1. Much like Monday’s victory at Piqua, Butler was once again propelled by an impressive pitching performance. Senior southpaw Ryan Qvick put up five impressive innings of three hit baseball, striking out nine. Backed by solid defensive play, Qvick had little trouble keeping the Indians off balance all evening. “Ryan pitched an excellent game,” said head coach Trent Dues after the win. Qvick was relieved in the sixth inning by senior Preston Tofstad, who held Piqua hitless through the final two innings. “We played some good defense and Tofstad came in and did a nice job in relief,” said Dues. Offensively it was another big night for the Aviators, as they scored nine runs for the third time this season. Freshman Boston Smith went two-for-three with a double and two RBI. Junior Karter Peck was two-for-three with a double and three runs, while fellow junior Cody Borchers all sizzled at the plate, going 3-for-3 an RBI and three runs. Collectively Butler peppered the Indians opitching staff for twelve hits, a showing that pleased Dues. “It was a good night at the plate. Cody, Boston and Karter really swung that bat well,” he said. Additionally freshman Carson Clark and seniors Caiden Serrer and Jack Mitchell each added an RBI in the lopsided win. Evident in the win is Butler’s depth and versatility in both the lineup and on the field. Story reprinted with permission from VandaliaButlerBaseball.com.